Where Do Airbnb Hosts Make the Most Money? Since it began operating in 2008, Airbnb has shaken up the hospitality industry, and reports are that it could soon be valued at over $20 billion. That’s nearly as much as Marriot International. With that much capital behind the Airbnb platform, it stands to reason that Airbnb hosts are cashing in as well. On the other hand, many of the most popular Airbnb destinations are also among the least affordable cities in the U.S. So how much money is it possible to make by listing a room or full home on Airbnb? Using data provided by Beyond Pricing, a service that optimizes pricing for short-term rental owners and Airbnb hosts, SmartAsset analyzed the profit potential of rentals in 15 of the largest Airbnb markets in the U.S.
First, we calculated expected revenue of private-room Airbnb rentals in each city.1 We wanted to know if it’s possible to pay the rent on a two bedroom home by listing one of the rooms on Airbnb. Then, we calculated expected net profits (after average rent, utilities and internet) for full-home rentals in each city. You can read more about our methodology below. $20,619. That’s the average expected annual profit of Airbnb hosts renting out a full two bedroom apartment or house in the 15 cities SmartAsset examined. While it’s not chump change, it also isn’t enough to live off of—which is why many “professional” Airbnb hosts rent multiple properties. 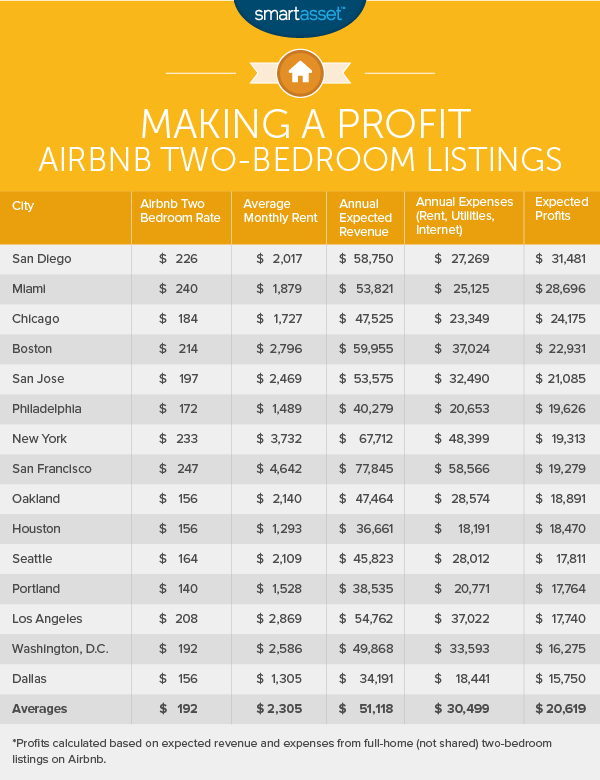 Miami and San Diego are the most profitable cities for Airbnb hosts. The combination of warm weather and (relatively) affordable housing make these two cities a better bet for full-apartment listings than popular but expensive destinations like New York and San Francisco. By the same token, private-room listings fare best in low-rent cities like Houston and Philadelphia. Renting out a single bedroom in a two bedroom apartment can serve as a good source of supplemental income in most of the cities SmartAsset examined. In half of the cities in our analysis, an “Airbnb roommate” would, on average, pay at least 80% of an apartment’s total rent. In Miami, San Diego, Chicago and Philadelphia, it would pay over 90%. In Houston, an Airbnb private-room listing would be enough to pay the entire rent on a two bedroom at the average occupancy rate of 64%. In many cities, it may be possible to pay the entire rent on a two-bedroom apartment with around 20 days of bookings per month. 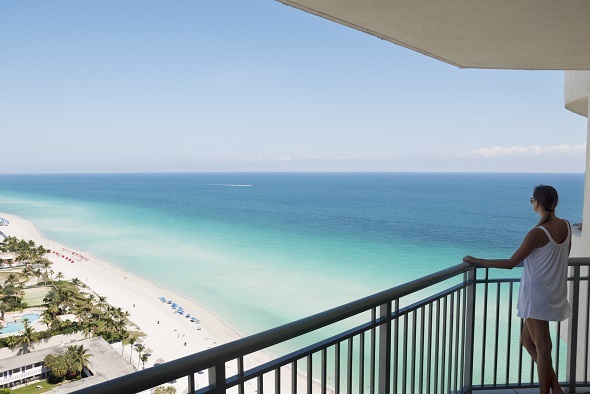 In Miami and Philadelphia, for example, an Airbnb host could pay the full rent on a two bedroom apartment by filling one of the rooms for 21 days a month. In San Diego, 24 days of bookings a month would pay the rent. Achieving those numbers, however, would require beating the average occupancy rates listed above. So, before you kick out your roommate and list the spare room on Airbnb, keep in mind the time commitment involved. Earning money on Airbnb requires careful management and active involvement. In general, “hands-off” Airbnb hosts can expect occupancy rates (and revenue) at least 15% lower than those listed. For Airbnb hosts looking to make a living on the hospitality platform, full apartment rentals are the way to go. Rates for full apartments are significantly higher than those for single rooms and income after expenses ranged from $15,000 to $31,000 in our analysis. The top cities were both beach towns: San Diego and Miami. 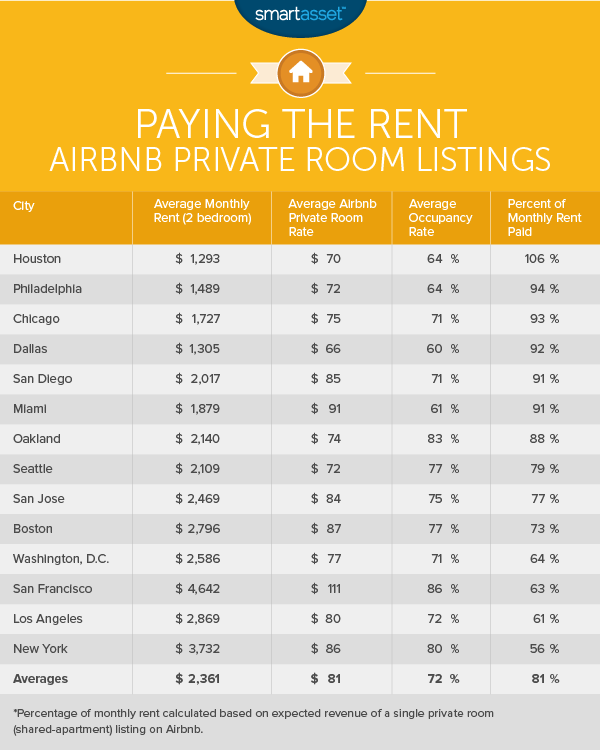 On the other hand, while San Francisco and New York capture the highest average Airbnb nightly prices, at $247 and $233 respectively, the exorbitant rents in those cities wipe out the additional income. That means there is an opportunity for renters or homeowners in those cities who have annual rent (or mortgage payments) lower than the amounts listed above. The Texas capital is one of the hottest Airbnb markets around. It has a nationally-renowned music and art scene, terrific food and four seasons of warm weather. On top of all that, festivals like SXSW and Austin City Limits periodically draw massive crowds from across the country. In fact, a significant number of Airbnb hosts in Austin only rent their rooms and apartments during festivals and rates during festivals can be several times what is normally charged. Some residents collect over $1,000 a night during SXSW, which attracts over 130,000 attendees in a city with just 30,000 hotel rooms (and only 7,000 in the downtown area). That’s a big money-making opportunity. However, it also skews the data. Because of Airbnb accounts that are specifically set up for Austin’s festivals, the Texas state capital has the highest average rental rate in the U.S. ($277 per night for a two bedroom) and the lowest occupancy rate (around 60%, and far lower than that in festival-free months, when accounts targeted toward festival-goers are dormant). Active hosts can expect a much better occupancy rate than that, but a lower price for most of the year. In some of the cities SmartAsset examined, hosting guests through Airbnb may be illegal, and in many apartment buildings it could constitute a breach of contract. In New York City, for example, the Department of Buildings has hit at least one Airbnb host with thousands of dollars for renting out his place while he was out for the weekend. Likewise, after an investigation by the New York Attorney General, Airbnb revoked thousands of New York hosts’ accounts for misuse. This is something to keep in mind wherever you are. How will your landlord feel about your Airbnb use? Will it bother your neighbors? Are there business or hotel taxes you may be required to pay once you start earning money? In some cities, including Portland and San Francisco, Airbnb has already started collecting these taxes. The same treatment may be on the way in other places. To calculate the monthly rent percentage, SmartAsset used average Airbnb private-room price, average Airbnb occupancy rates and average monthly rent for each city. We first calculated expected monthly revenue by multiplying the average Airbnb occupancy rate by the number of days per month, for an expected number of bookings per month. We then multiplied the expected bookings by the nightly price to arrive at expected revenue. Lastly, to arrive at the monthly rent percentage, we divided each city’s expected monthly revenue by the average monthly rent. The percentage yielded is an average across all 12 months. Note however, that it will be higher in long months, like January and lower in short months, like February. Those extra days are extra opportunities for revenue! SmartAsset used a similar formula to calculate expected profits from full-home rentals, but we added expenses into our analysis in order to capture the full costs of maintaining the home. First, we multiplied each city’s Airbnb occupancy rate by 365 to arrive at bookings per year. We then multiplied bookings per year by nightly Airbnb full-home price to reach expected annual revenue. From that we subtracted total annual expenses, which was equal to twelve times the sum of each city’s average monthly rent, utilities cost and internet rate. The key point for both of these methodologies is that they give expected revenue and profits based on averages. Individual apartments and individual Airbnb hosts can (and do) over- or under-perform these numbers. Hosts who actively manage their listing on a daily basis by keeping their property in good shape, adjusting prices to market conditions and being friendly and helpful to guests (which often leads to more and higher reviews) could earn more. Data on average Airbnb prices and occupancy rates came from Beyond Pricing, which tracks thousands of listings in each of the cities we analyzed. Data on average rental rates came from MyApartmentMap.com. Data on average utilities rates came from the Council for Community and Economic Research. Data on average monthly internet came from Numbeo.com. 1. We excluded Portland, Oregon from this portion of the analysis because of a lack of reliable data for the private room market in that city.